GUATEMALA CITY, Dec 14 (AP). 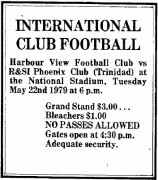 THE SECOND Central, North American and Caribbean soccer tournament will be played here April 25 to May 9, 1965, the Organizing Committee announced today. Teams from Trinidad, Dominican Republic, Cuba, Haiti, Netherland Antilles, Nicaragua, Honduras and El Salvador are entered for the preliminary rounds. Guatemala and Costa Rica are exempt from the preliminaries.